I sort of have a relationship with margaritas. This margarita recipe, to be exact. I’m sort of in love with them. The best margarita recipe on the rocks? Yes. Exactly. I’m sort of a huge snob about them. Like, super huge. No other margarita recipe can compare in my brain. Also, I’m sort of positive that the only ingredients you need are tequila, grand marnier, lime juice and homemade simple syrup. Nothing else. I mean, some citrus, but that’s about it. I’m sort of still hungover. Good sign. 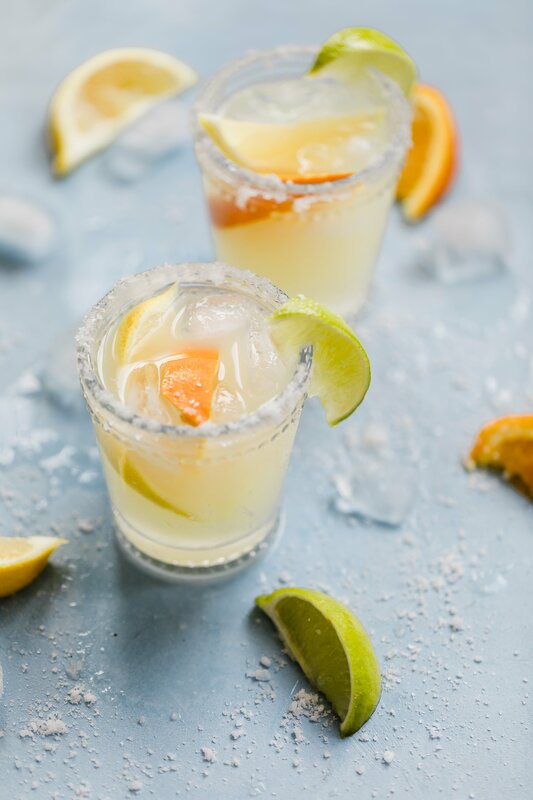 Rim the ridge of your glass with a lime wedge and dip in margarita salt. Fill the glass with ice. In a cocktail shaker, combine tequila, grand marnier, simple syrup and lime juice with ice, and shake for about 30 seconds. 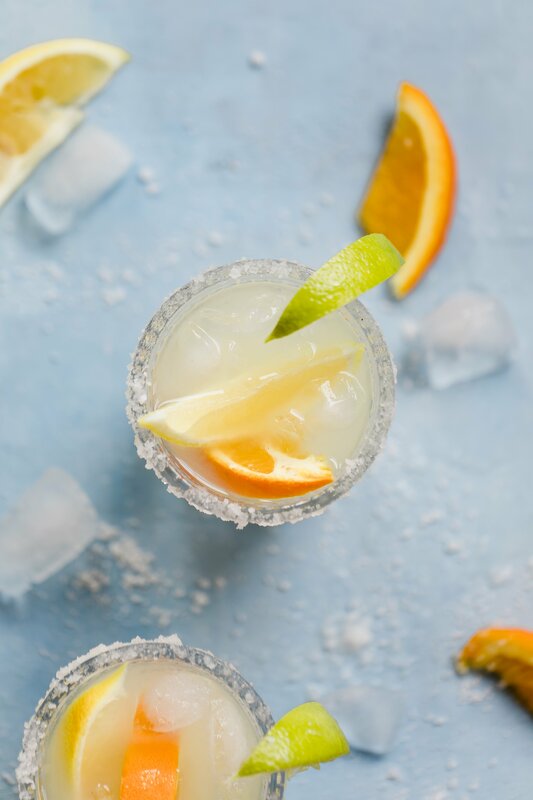 Pour over ice and squeeze in lemon, lime and orange slices. Annnnnd I’m sort of convinced you don’t need much convincing. Make them. Cookies and Cream Cheesecake Bars. We had margaritas last night. They were not as pretty as yours, but still fresh, simple and yummy. Oh, and we had mojitos too. Cheers! Beautiful photos!! Makes me want summer to come faster! That pitcher is so cool! I think whoever gave that to you for your wedding has good taste! LOVE me some Margarita. I have been drinking Skinnygirl, and although it probably isn’t nearly as good as yours, it’s low calorie and pretty good. I will have to try your recipe next time instead!! Try Agave Nectar!! I work at a tequila bar that had over 120 bottles of tequila (!!) and they made the most to-die-for margaritas with agave instead of sugar, and Milagro Silver Tequila. Amazing! …can I come live with you? PS. The Buffalo Mac was a big hit! DELICIOUS. Those are definitely the prettiest margaritas I’ve seen in a while! I love the touch of the three citrus slices. Coolest pitcher ever! I love margs!! Wonderful presentation. I too love a good margarita on the rocks, this one looks splendid! coolest pitcher i’ve ever seen. i love it. This looks like my type of margarita! I’ll be making it this weekend…or sooner! This looks so delicious! I’ll have to make a trip to the store tomorrow since I don’t have any of the Grand Marnier at my place. Mmm this is cruel when I’ve been trying hard to only drink those Skinny B**** magaraitas (is this a PG blog? lol). They’re not nearly as good, but wooo do margaritas pack some calories. I think I may have to spoil myself and try your recipe for Memorial Day weekend! I need a pitcher like that! Full of margaritas. Like this. I’ve been making your margarita’s all weekend (ok I started Thursday) and now I’ve added your guacamole to the mix. I’m in heaven and may only pull it together enough to run to the store for more supplies!! Happy 4th of July!!!! These are delicious!! My husband and I have been rocking these all weekend :) Just wondering if you have tried using the Gran Gala liqueur? I’ve heard it tastes just like Grand Marnier, but is half the price…thought maybe since these have become a staple in our afternoons/evenings, something a little cheaper than Grand Marnier may be a great option! Would love to know how you get that nice mojito green color with Margaritas that are more GM than tequila. Green color? These aren’t really ever green and are more clear than anything. If you’re referring to the color in the pitcher it might just be from the citrus slices and reflections of glass against the window while photographing. I am obsessed with your delicious margarita recipes.I plan to make some of them up for the 4th. You wouldn’t have the recipes for a pitcher would you? I think I can stop with your recipes. Oh dear, what to do the rest of the summer?